Which ever way things go, with virtual reality, we’ve got to get in gear. For me, this means getting organized and productive. 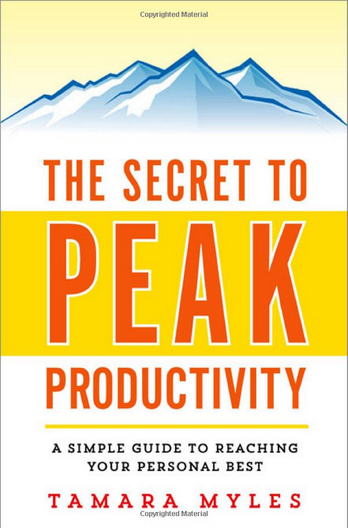 To help the process along, this week I’m reading The Secret to Peak Productivity by Tamara Myles. It’s all about the value of clear, concrete goals, and priorizing. For example, I’ve been doing Hypergrid Business for five years at a loss. This isn’t a bad thing — I have a lot of fun with it, and have learned a great deal, and gotten to know some super people. But in the back of my mind I’ve always had the idea that I would someday quit my day job writing general enterprise technology stories and just concentrate on virtual reality. In practice, what winds up happening is that I would do my day job. I would do the family stuff. 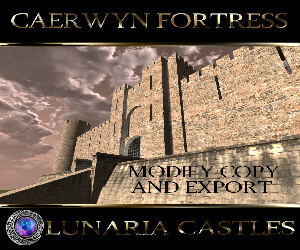 I would do the urgent Hypergrid Business things — the breaking news articles, the monthly stats reports. And I would do the fun stuff, like columns and reviews. But the hard things, that would really help build the publication, would always get postponed. And they’d never get done. I spent an entire afternoon and most of an evening last week on this fun project. Was it really necessary? Probably not. Maybe I need to revisit that prioritization step again. And I’ve tried to make this a priority in the past — but there’s just so much other stuff to do. Fortunately, some of the things that used to take up a lot of my time are history. One of my kids is at college, the other has quit the swim team and is about to get his driver’s license so I’m not spending half of each day driving kids around anymore. That frees up a little bit of time. But I’ll also have to give up some things I enjoy. Like sleeping in late on days when I don’t have early meetings scheduled and then staying up late watching TV because I can’t get to sleep. And I’ll have to give my current organizational system and trade up to something a bit more appropriate for the amount of work I need to get done. Keeping a to-do list in my head isn’t cutting it any more. The “Secret to Peak Productivity” book also reminded me of Stephen Covey’s system of sorting activities based on urgency and importance. Too often, we get caught up in the urgent but unimportant stuff, and the non-urgent but important long-term goals get short shrift. So I’ve been trying out different to-do list apps and project management apps, experimenting with spreadsheets, even using a paper planner. I’ve narrowed it down to Google Tasks, because it’s integrated with my calendar and email inbox. As long as I can read my own handwriting, that’s all that matters. And a paper journal, because I can jot notes in it at night before I go to bed and it feels satisfying to get stuff out of my head and onto real paper, and allows me to fall asleep with a clear conscience. One technique that’s worked out really well for me comes right out of my nightly prioritization exercise. 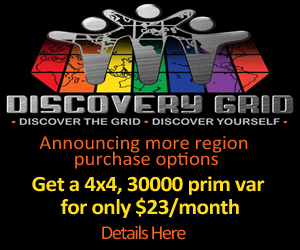 Say, I have a goal of making Hypergrid Business profitable. Before I can do that, I need to find out how to make a blog profitable. So, for the next day’s tasks, I add, “Research how to make a blog profitable.” Turns out, there’s a lot of material out there on this topic! So, next night, I revisit this goal again. Except this time, in order to make Hypergrid Business profitable, I know that I first need to set up a mailing list. But before I can set up a mailing list, I need to research mailing list software and install the right plugins. But before I can install the right plugins, I need to redo the website. And before I can redo the website, I need to pick a new theme. But before I can pick a new theme, I need to decide what it needs to look like. And before I can decide that, I need to look at what other tech publications are doing. Finally! 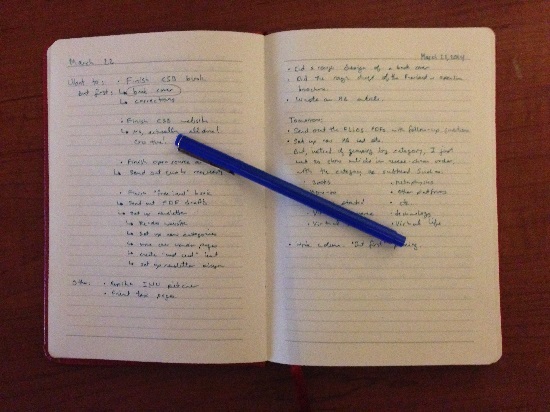 I’ve reached a task that I can easily do the next day — and I add it to my agenda for tomorrow. Best thing is, by putting something clear and simple like, “Research how to make a blog profitable” or “Look at tech publication websites and pick a favorite look,” it makes it much more likely that I’ll actually get that task done. And that takes me a step closer to my top goal. The idea of self-discipline has been coming up a lot lately. Myles’ book is only the latest that covers the topic, and how critically important the skill of self-discipline is to success. Unfortunately, recent studies have shown that willpower is like a muscle. You can build it up over time by exercising it. But if you try to use it too much all at once you just get tired out. So, lately, I’ve been trying to arrange my life so that I have to use my willpower as little as possible, so I can save strength for important stuff. Take, for example, waking up in the morning. It takes more willpower than I can muster up before I’ve had my coffee to wake up early and get a head start on the day. But it takes no willpower at all for me to wake up for an appointment or meeting, however. If I have an appointment, I don’t have a choice. I have to get up whether I want to or not. Some people suggest making appointments with yourself. Hah. I’m not an idiot. If I write “get up early and get a head start on taxes” on my calendar I’ll sleep until noon because even when groggy, I know that the taxes can wait a couple more hours. For me, appointments with myself might as well be wide open spaces on my calendar. The couch. It’s always there, waiting for me. A few years ago, I had a similar problem when I first switched from breaking news reporting to feature writing. With breaking news, the story is due right away. There’s no time to put it off. No willpower required — you just power through on adrenalin and fear of the editor screaming over your shoulder. With feature writing, however, there’s always tomorrow. I figured out a system to deal with that, however — I contact my initial list of potential sources right when the story is assigned. Then, as people get back to me, I schedule calls. By the time the deadline gets close enough to worry me I’ll have already finished most of the reporting, simply by reacting to incoming emails from sources. Now I’ve taken this approach and expanded it to planning my day, by scheduling at least one call first thing in the morning. And if I don’t have calls, I create them, by setting up meetings with colleagues, friends, business partners, and assistants. I have a business partner in Europe and an assistant in India — they’re more than happy to meet with me at what for me is early in the morning and, for them, the middle of the day. And I have a standing meeting at 8 a.m. every Monday morning with a local book editor friend where we get together at a local cafe to talk shop. Plus, my best friend is working on a book about his work in Asia, and he’s more than happy to take some time to chat about writing once or twice a week. As a result, I now find that I’m way more productive during the day. Plus, by waking up at the same time every morning, I avoid the cycle of sleeping late, staying up late, sleeping later, staying up later, and then waking up early one morning and being super tired all day, thus starting the cycle all over again. It’s been two weeks so far, and it’s been working. Knock on wood. The MetaverseTV camera adds ten pounds. Also, confession: that’s not my real hair. An even bigger change has been switching to a low-carb diet. Now, this gets a little bit more personal than I normally go in these columns, but, well, I’m a middle-aged woman, and not the skinny 20-year-old that my avatar looks like. (Also, while I’m confessing — my hair isn’t really blonde. I dye it!) Anyway, my metabolism isn’t what it used to be, and the fact that I have a desk job doesn’t help. So I have to watch what I eat, count calories, exercise portion control. I was constantly having to use my willpower — and it wasn’t working. I was tired all the time. Hungry all the time. And despite all the whole grains and lentils, I was eating, the weight kept creeping up. Then, last summer, in frustration, I took my mom’s advice and went on a low-carb diet. No grains — at all. Almost no fruit. No potatoes, no rice, no bread, no corn. No beans or lentils. Just leafy green vegetables, proteins, oils and fats. I checked with a doctor and with a nutritionist but even without their okay I’d have to say that I did the right thing. I’m no longer tired. I’m no longer hungry. I don’t have to count calories or watch portion sizes. I eat when I’m hungry and stop when I’m full — no willpower required. It helps that the kids are mostly out of the house and I was able to clear out all the carbs-heavy foods. And I carry lots of snacks while on the road, to avoid the temptation of fast food places. When I get hungry, I reach for a snack right away, and then I don’t have to battle the desire for Taco Bell. The downside is that I’ve had to learn to cook all over again, since my previous repertoire relied heavily on beans, lentils and chickpeas — all now off the menu. I have, instead, become a big fan of cauliflower, chia, flaxseeds, almond milk and almond flour, full-fat everything, and meats of all kinds. I’m no longer using my willpower to avoid unhealthy snacks because first, I don’t have them in the house and second, because I’m never hungry. I don’t have to stop eating before I’m full. Proteins, fats, and high-fiber, low-carb veggies fill you up very quickly, and digest slowly. And there are no sugar spikes — or crashes — to generate cravings during the day. Now, when faced with an empty stretch of time before my next call, it takes very little effort for me to pull up my to-do list and knock off the next task instead of lying down on the couch and catching up on the Daily Show or taking yet another snack break. Working from home creates an endless stream of opportunities to not be productive. It’s not always easy to just say no. And one in one final bit of productivity-related innovation, I finally got on top of my inbox. 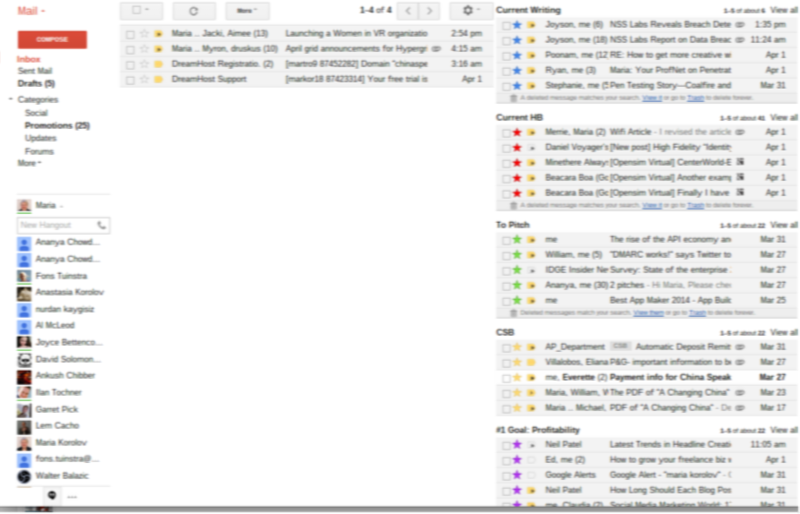 I use Google Apps for Business, and have been playing around with Gmail’s Multiple Inboxes. It allows you to divide up your inbox into multiple panes, each one showing a different kind of mail. For example, you can filter based on who the emails are from, or what folder they’re in, or — as I do — by their stars. A view of my email, blurred to protect names of confidential sources. Gmail automatically filters out the spam, and puts not-spam-but-still-promotional emails in a separate folder. In the mornings, I check the Promotions folder and usually delete everything in with a single click, then do the same for an Updates folder and a Social folder. That gets my in-box down to a manageable size. Then I glance through the subject lines and mark everything related to my current work assignments with a blue star — a single click — and everything related to Hypergrid Business with a red star — two clicks — and archive those emails. Now they instantly show up in the panels on the right-hand side, where I can deal with them in bulk, at the proper time. I also have a green star, for ideas for stories to pitch, and a yellow star for things related to the China Speakers Bureau — another project that I’m working on — and finally a purple star for everything related to my number-one goal this year, making my virtual stuff profitable. I decided to use stars instead of folders or labels to categorize my emails because making something with a star is quicker than assigning a label. I’m all about saving the mouseclicks. If it’s something I can deal with right away, I deal with it right away. If I don’t have to do anything about it, I just archive it or delete it. Within a couple of days of setting this up, my inbox of 200-plus messages was empty. And it turns out that this system works so well that I’ve begun using it for other things. When I come across an interesting article on the Web that might make for a good story to pitch to, say, Network World, or to write up for Hypergrid Business, I just email it to myself and star it. That way, I don’t have story ideas scattered across multiple notebooks, spreadsheets, Word documents, Evernote files and browser bookmarks. I hope there was something useful in here for those of you looking to find more time for virtual reality projects now that this sh — sugar — just got real.